And it is certainly a good description, constantly touted by local radio. There is so much more to see and do than you would think here. But do not expect the same sort of experience as you will have in Brighton or Blackpool. This is almost a forgotten sun haven on our very own coastline. Forget family holidays and rest homes for the elderly. While these are still in evidence, the resort has come a long way in the past few years. Boasting beautiful European Blue Flag sandy beaches, in close proximity to The New Forest and it's sleepy villages, and close to attractions such a Lulworth Cove, Monkey World (remember Anneka Rice! ), Beulieu, the historic town of Christchurch, the Poole potteries and restaurants of Poole harbour as well as Brownsea Island, close to Southampton and Lymington to take the ferry to the Isle of Wight, you are not short of places to visit or things to do. The seafront at Bournemouth has undergone many changes in recent years, now boasting an Imax cinema, International Conference Centre hosting regular major star performances and concerts, pretty gardens that wind down to the sea and many bars and cafes to rest in along the way. Much of this has been brought about by the University and many language schools that have grown up, bringing a more youthful and European feel to the town Centre. For gay life, do not expect anything amazing, as the town settles into the local and student scene from September to March, but the sunshine from Easter to the end of summer attracts many tourists. The beautiful beaches along Studland Bay which are reached by a small ferry, are not to be missed, and you have the option of baring all to the world along the nudist beach. At night you have the option of a few bars and a club. The main gay venue is the The Exchange which is a popular music bar, and can get very cramped with it's narrow layout, OK if you like being squashed against lots of men. '2930 The Triangle' is the only club in town, having been refurbished this offers regular cabaret and a dark dancefloor area playing the type of music you would expect. You also have the choice of The Bakers Arms (gay friendly) if you fancy cosy pub life. 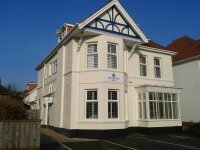 The Branksome is a really trendy place to be, with its friendly bar staff offering a warm welcome to all. For those requiring some extra heat then you have the The Spa and The SaunaBar are men only steam and sauna houses. While perusing the shops in town try Legends Cafe Bar for a friendly lunch or something more substantial in the evening, offering a varied menu and pleasant surroundings close to the Gardens. 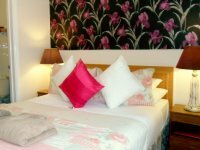 Accommodation, as you would expect, is varied and plentiful, from the five star Carlton or Royal Bath to many B&B's close to the town centre. In all Bournemouth is a very pleasant surprise made infinitely more appealing when the sun shines. I would recommend you check the weather forecast before you go, as no seaside resort is as much fun in the rain. When the sun shines however, which is considerably more often than in Blackpool, and no pebbles like Brighton, shut your eyes, slap on the sun block and you will feel that you are more South of France than South of the UK. Look for the red clad Beach /Life Guards who add a little Baywatch to Britain. With so may things to do around and about in the Dorset area, even a cloudy day can be filled. © UK Gay Hotel and Travel Guide. March 2019. Bourne Free is Bournemouth's LGBT Pride Festival. It is an annual celebration of all diversities that live in Bournemouth and the constant strive towards universal equality for all through entertainment and awareness. Description: Relax in this oasis of elegant charm, set in a gracious tree lined avenue in the attractive and historic East Cliff area of Bournemouth. You will love the warm welcome at our small, country-house style Bed and Breakfast hotel. You will find all the quality facilities you should expect of a four star Bed & Breakfast hotel, including comfortable accommodation, great home cooked food, attentive service and real value for money. We invite you to feel at home in our relaxing, peaceful surroundings. 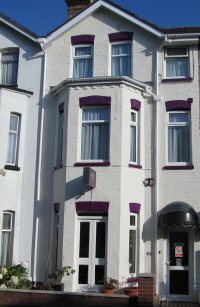 "Gay owned / Gay friendly"
Description: Crossroads is a lovely quality boutique hotel situated close to the lovely sandy beaches of Southbourne and Bournemouth. We offer comfortable accommodation in a relaxed and friendly atmosphere. Description: In the heart of Bournemouth, just a short walk from the sandy beaches, the hotel offers refurbished rooms with new beds and power showers. 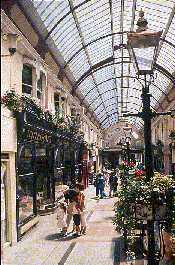 The hotel's convenient central location means that all of Bournemouth's shops, pubs, and cafes, bars and restaurants are nearby. The seafront is just a very short walk away and some of the rooms even have a sea view. Description: The Amarillo, formerly known as Amarillo Hotel, is an ideally situated guest house, run as a bed and breakfast, in a quiet area just opposite the delightful award winning Knyveton Gardens with Tennis courts, Bowling greens and Petanque. We are within easy walking distance of the beautiful and famous golden, safe and sandy beaches that Bournemouth holidays are so famous for. Description: The Bondi is an attractive mid-terrace Victorian House set in St Michael's Road close to the fashionable Gay Triangle Area of Bournemouth. We are ideally situated for visiting the main shopping area, award winning beaches, bars, restaurants, nightclubs and Bournemouth International Centre. We offer a continental style breakfast which provides a healthy alternative. The Bondi is the small Guest house with the Big Heart. "Gay friendly"
Description: HAMILTON HALL - a retreat style hotel for gay and bisexual men only. NOURISH YOUR SOUL. Self and Spiritual development workshops all winter long for gay men - by gay men. Bournemouth gay friendly bars and clubs. Bournemouth's trendiest and hottest place to be seen at on the gay scene. We're situated just above the very busy and highly popular 'Branksome' on Commercial Road at The Triangle. Traditional gay pub open daily with a disco and quiz night on a Tuesday, request night on a Thursday and a busy pre-club venue on a Friday and Saturday, cabaret on a Sunday. It launched in 2008 and has become a firm favourite with the locals ever since. They have some great drink promotions, live acts and 2 bars and 2 dancefloors with some top local DJs.